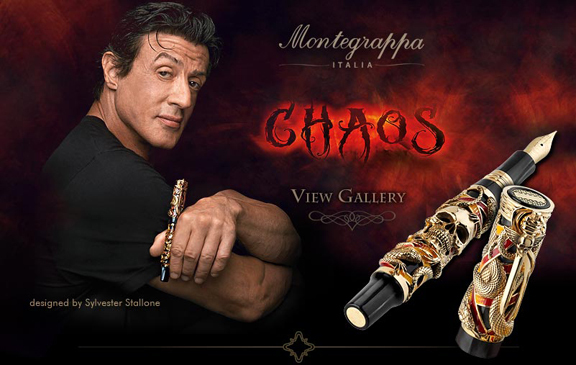 Drawing inspiration for the theme and design of this pen from his recent film, "The Expendables," Mr. Stallone turned to classical art and worked with Montegrappa’s artisans to create the “Chaos” pen. The pen design was inspired by the works of 16th century artists including Battista Franco, Albrecht Dürer, Hans Sebald Beham, and Antonio Pollaiolo to create Mr. Stallone’s idea of Chaos; "a sense of the Renaissance, when things were difficult, more simplified and perhaps more noble, placed against our current technological society." Sylvester Stallone’s “Chaos” pen is fashioned from precious materials and produced in limited numbers. The body of the pen is made of black pearlized celluloid with overlays in sterling silver or solid 18K gold. The overlays are finished by hand by Montegrappa's skilled craftsmen and feature an antiqued finish with accents in red and yellow translucent enamel to represent the colors of fire. The pen design is characterized by the juxtaposition of life and death, with reptiles representing the early forms of life on Earth, and the skull signifying death. The ultimate defining detail, bearing both a fist and a skull, is the pen’s clip in the form of a sword. This is not a pen to be taken lightly. The “Chaos” pen is the first from the “Cult” collection and is available as a limited edition of 1,000 fountain pens and 912 roller balls in sterling silver, which represents Montegrappa's 1912 date of establishment. Additionally, 100 fountain pens and 100 roller balls in solid 18K gold and 10 fountain pens and 10 roller balls in solid 18K gold with precious stones will be available for enthusiasts of both Sylvester Stallone and Montegrappa. To complement this pen, Montegrappa’s craftsmen have fashioned an inkwell in rock crystal and sterling silver or solid 18K gold. The Chaos inkwell is available as a limited edition in numbers and materials matching the pens. The Montegrappa “Chaos” collection is now available as a special order item. Montegrappa has been manufacturing high-quality writing instruments in the same historic building in Bassano del Grappa, North East Italy since 1912, but it's safe to say that nothing like this has come out of their workshops until now. Gold Retail: $65,700.00 Call for our Special Pricing!